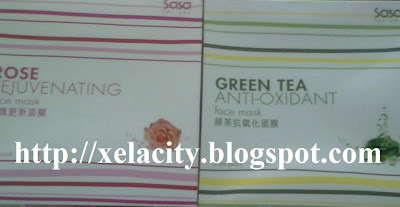 Sasa Malaysia is now having the promotion for their company’s brand face mask. Each pack of mask (consists of 3pc masks) is being sold on RM19/pack. But once you purchased 1st pack, 2nd pack will cost you RM1 only. Just pay RM20 and you can get yourself with 2 packs of either same or difference functioning Mask, or a total of 6 pc of masks. There are with 5 difference function of mask serving difference age stages from youngsters to seniors. Green tea extract contains antioxidant properties which protect skin from free radicals. It also enhances detoxification and cell activation for a clearer and more luminous complexion. Rose extract contains whitening,moisturizing and anti-oxidant properties which wnhances deep repairing and cell regeneration. It promotes skin radiance, prevents pre-mature aging while insuring perfectly hydrated skin.